This year, we have a chance to help students and protect taxpayers across California, and I hope we don’t miss it. The California State Legislature is currently considering whether to ban for-profit charter schools. Educators — whether at district or charter public schools — can agree: public schools must serve students, not shareholders. Profit has no place in our public schools, and I urge politicians in Sacramento to make that the law. For too long, the politics of public education have often been defined by petty bickering instead of problem-solving. That’s particularly true when it comes to public charter schools. This is a subject I know well: I started my full-time career in public education helping to build a nonprofit charter school organization called Green Dot Public Schools. I had always liked the flexibility of charters and the idea of innovation driving change, but I really bought into them when I met Shirley Ford, one of the first parents I met while working at Green Dot. Shirley didn’t want to send her son Robert to Inglewood High, where fewer than 10 percent of students performed at grade level, but she didn’t have the money to move to a different neighborhood or pay for a private school. Shirley worked hard to help us build Ánimo Inglewood Charter High School, one of our Green Dot schools, and Robert graduated from that school before going on to become a teacher. That’s just one story of thousands who benefited from our high-performing public charter schools. But while I know from experience that nonprofit public charter schools can offer opportunity and hope in some of our most underserved neighborhoods, I’ve also seen how for-profit schools fail to serve students’ best interests. Thanks in part to Education Secretary Betsy DeVos, her home state of Michigan leads the nation in for-profit charter schools and provides many examples of the corrosive influence of the profit motive in managing public schools. One such school used taxpayer money to pay $5 million for a piece of property valued at $3.2 million. The school’s for-profit operator had a financial stake in the company that sold the school the overpriced land. Our public schools must have one bottom line, and it should not be profit. Doing what’s best for kids must be the mission of every school in California. No school should ever be caught between squeezing out a larger profit for shareholders and delivering stronger services for kids. While the Trump Administration threatens the very promise of public education with its proposals to take money from things like teacher training and put it into private and for-profit schools, California should lead the way. By outlawing for-profit charter schools, we can protect students and taxpayers, and ensure our public education dollars go to classrooms, not profits. Let’s put aside the usual political bickering and stand together for students. I urge the state legislature to find common ground that puts our students above all. 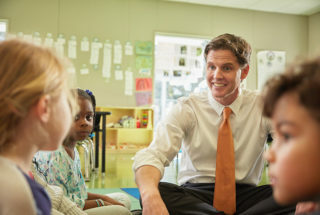 Marshall Tuck is an Educator in Residence at the New Teacher Center and a candidate for State Superintendent of Public Instruction.